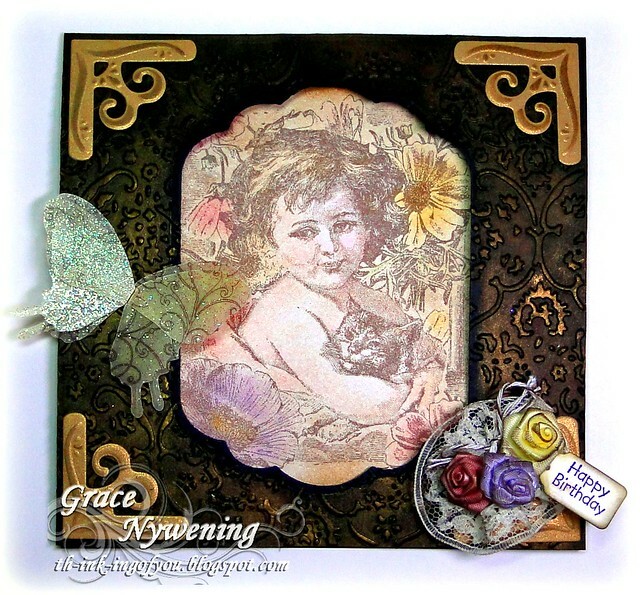 Th-INK-ing of You: Vintage LaBlanche Birthday ~ Challenging! • Add three colors of flowers for the focal point. This image is new to me. It's from LaBlanche and it's a silicone stamp I bought from my DT sisters new store... The Craft's Meow. 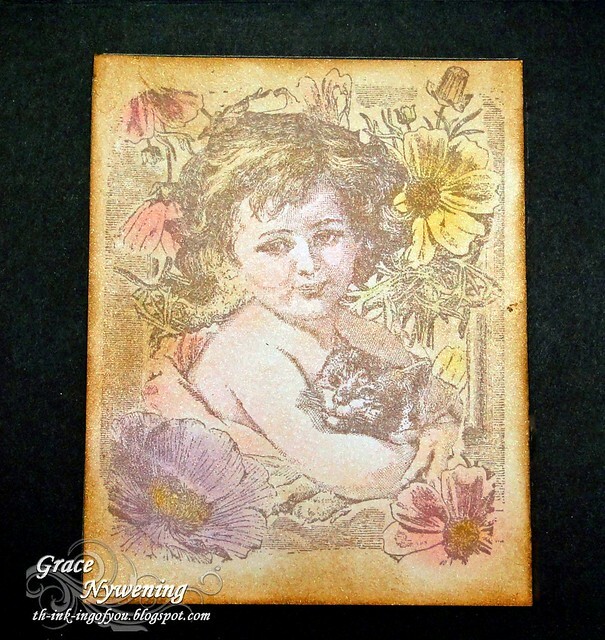 Lisa has a link to a great video on coloring these images with blending stumps and distress inks. I did not feel I had the right colors of inks to do that so I tried for one of those sepia toned cards with just a hint of color. Not sure I achieved that either, but I used SU! Chalks to color this. I then spritzed heavily with Glimmer Mist in Gold to set the chalks, then I layered on different colors of distress inks with a sponge, hitting some places and avoiding others. I went right over the image with some of the colors, and just did the edges with others. I spritzed again with Glimmer Mist when done sponging. IRL there is a gorgeous glow to this picture but I cannot capture that. I used the three colors for my flowers around this sweet vintage image. Next I had to create a card large enough to frame it within a cut out. I wanted it to look like a vintage metal frame. I chose this Spellbinders Label 11 to cut my window from SU! Basic Black. Next I used metallic cream paint and just rubbed it on again in various shades. Then I ran it through with a Cuttlebug embossing folder, matching it up in the middle as it took two passes to do it. At this point I was pretty happy with it but then I started embellishing it and now I'm not so sure. I added a vellum butterfly from the Bridal Dept. at Michael's, brushed gold corners from a very old Spellbinders corner set, and made a little nosegay of ribbon blossoms ( I made the lavender one) and seam binding lace to pick up the flower colors again. I added a tiny tag with my birthday sentiment on it. In looking at it now, I'm not sure I like the embellies, but this was just playing around so you get to see my experiment. LOL! I love these vintage images and hope to play some more to achieve just the look I'm after with them. This is the inside of the card. Any message would need to be written on the back where I would add a mat of cream or tan. The stamp is fairly large so using it for the cut out window didn't leave me much room for a message inside. Thanks for taking a look at my little "experiment". Hopefully I'll get better at this! LOL! Have a great day! Stunning, I just love the shape to the window, just great! Beautiful image and Beautiful coloring Grace!!! Pretty image and love the embossing :-) wonderful card! Thanks so much for sharing your lovely creation this week at The Shabby Tea Room! Your coloring technique came out beautifully! I like the roses representing the egg colors, and that background you did looks like metal. Your card is gorgeous. Love the vintage look and all the details you used. Thanks so much for joining us at Joan's Gardens #12 Weekly Card Challege. Great job. Wowwww Grace,what a wonderful card,i love the image and your papers. Such a beautiful card Grace! Your card base looks like a piece of vintage tin! Fabulous work! Thank you so much for joining us this week at The Shabby Tea Room! Grace, this is beautiful! Isn't it fun to create 'just for fun' now and then??? Miss you, darlin'!!! Hugs! I'm loving the soft colors with the vintage look! You've got me inspired to try my hand at one of these. I've been meaning to, but time runs away from me! thanks for the shout-out, my friend! I think your card turned out fabulously, such a wonderful image to use inside the window. The embossing on the front of your card looks beautiful. WOW Grace this card is gorgeous. I love the vintage look. Very elegant card! Great flowers! Thanks for joining us at There's Magic in the Air this week. Grace, this is stunning, you're amazing and thank you so much for the sweet comments you left on my blog. WOW WOW WOW Grace this is totally GORGEOUS!!! I LOVE the embossing, those gold corners and your stunning embellishments!! This looks soooo amazing, I can't stop staring at it! This is beautiful Grace, love that butterfly. Thank you for your sweet comments on my blog - thank you too for your prayers for my neighbour - she is stable today, still in intensive care and still very ill. I know you through ODBD, I always like ur work, and this one is toooooooo fantastic fabulous.wow. Thanks for joining with us this week at Stamp-n-Doodle. GORGEOUS! Love that image and all the inking is fabulous! This is just adorable! I love the look of this especially with the colored flowers on the bottom right! Very very nice! Thanks for joining us at The Crafty Pad Flowers Challenge this week & good luck in the draw! This turned out gorgeous, Grace! 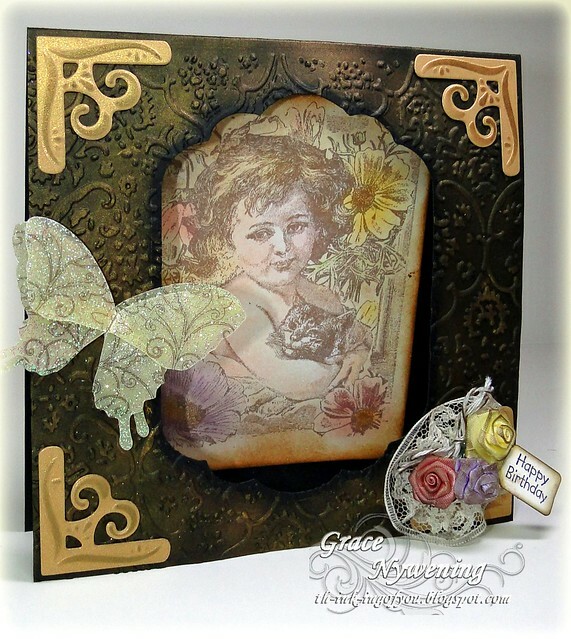 I love the antique textured background and the softly colored La Blanche image. 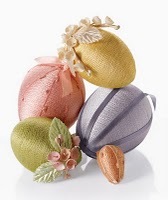 Beautiful embellishments, too! Have a great weekend! Hugs! so very pretty...Thank you for playing with us at IDIC this week! Just GORGEOUS Grace! I can always depend on you for inspiration! Congratulations!!! you are the winner of the scrappy frogs flowers and lace challenge! please email me your address at mindyrapp at gmail.com. PS your card is beautiful!!! Grace, this is beautiful and very vintage! I love how you instictivly knew what colors to layer at what level, and when to spray, and when to switch to other items. It is beautiful. And, I love the butterfly!